It has been almost a year since I first read Richard Tedlow’s “Giants of Enterprise” and I still haven’t got over the hangover. Several times I revisited the book for some specific incident or information like to check George Eastman’s early experiments and I ended up spending the next half an hour reading much more. It is a kind of stuff I had never read before. The book opened a door of a totally new discipline for me – that of “business history”. 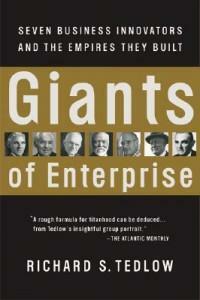 What is “Giants of Enterprise” about? The book contains biographies of seven innovators who built large enterprises in America from railroads to microprocessors: Andrew Carnegie (Steel), George Eastman (Kodak), Henry Ford, Thomas Watson Sr (IBM), Charles Revson (Revlon), Sam Walton (WalMart), Robert Noyce (Intel). In my opinion to say that the book is a bunch of biographies doesn’t do justice to it. · Role of influencers: For each of the innovators, Tedlow identifies one or two key influencers in their life and shows how a few individuals influence formative minds. If your boss fires you, chances are high you will hate him. And if you don’t, it is almost certain you won’t continue to adore him. Well, even after John Patterson fired Thomas Watson Sr. from National Cash Register, Watson continued to adore his ex-boss. Watson’s son wrote, “Oddly, dad never complained of this treatment and revered Mr. Patterson until the day he died.” Watson told his son one day, “Nearly everything I know about building a business comes from Mr. Patterson”. As Tedlow writes – “Both men dominated their organizations. Both were big spenders on themselves and on the others. Both demanded, explicitly or implicitly, complete allegiance to their views. Both were, in a sense, totalitarians.” Tedlow shows how Tom Scott played a similar role for Andrew Carnegie. · Psychology of turning points: One of the specialties of Tedlow is to identify one or two key turning points in one’s life and analyze them psychologically. For example, one such point Tedlow presents is the day Henry Ford announced on January 5, 1914, “The smallest amount to be received by a man 22 years old and upwards will $5 per day…” According to Tedlow, this was the point where Ford’s modesty became a thing of the past. He developed an insatiable appetite for headlines. To borrow Warren Buffett’s terminology, Henry Ford forgot about his “circle of competence”. And Tedlow concludes that from this point onwards it was all downhill for Ford. You may or may not agree with Tedlow. But I enjoyed his analysis. · Anatomy of innovation: If a general reading about an innovation, say through wikipedia, can be compared to watching a dressed up man, then reading this book is like seeing the man in an operating theatre and a surgeon showing you the details from inside. Not everybody may like it. But for me, it is a like having a “flight simulator” to play with. If you want to know exactly at what point Eastman might have got curious about photography or how much money was he already making from his photography business before he quit his banking job or when did he realize that patents are not enough and he needed to create a brand (like Kodak) you can find it in the book with all the gory details. “Chance favors prepared mind” is my favorite law of innovation. I found this book to be the best so far that gives a glimpse of what “chance”, “a prepared mind” and “favors” mean. Tedlow shows again and again that “success” is like any other addiction. One doesn’t know where to stop. Personally “History” had lost to “Science” as a cool subject by a wide margin when I was in school. After reading Tedlow, it rekindled my interest in history. Thanks to Tedlow I got an opportunity to appreciate the worlds of Gita Piramal (Business Legends), Ramchandra Guha (India after Gandhi) and many more. My engagement with my clients is called an intervention. It is similar to your doctor or fitness coach intervening in your regular routine through your working engagement with them. The objective is the same: help client become healthier. The question is: When does an intervention begin? There are two schools of thought. One school says that an engagement has two parts. The first one is about diagnosis which in an organization setting begins with surveys and/or interviews of various stakeholders and ends with planning of the intervention. The second part is the actual intervention. 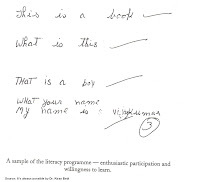 Prof. Edgar Schein belongs to the second school which says that intervention begins with the diagnosis itself i.e. with the first question you ask your client. Now, you might say, “What difference does it make?” Following story tells how much of a difference it can make. Monday 3rd May 1993 was Kiran’s first day at Tihar. She had made a brief visit the previous Saturday and met her direct reports. Without settling down Kiran went for a round of Prison No. 1 (there are 4 prisons in Tihar). It was just a 20-yard walk from her office. She had to pass through two giant gates before actually entering the prison wards. Wearing a uniform was not mandatory. So Kiran wore a full-sleeved pastel pathan suite topped by a waist-length Nehru jacket. 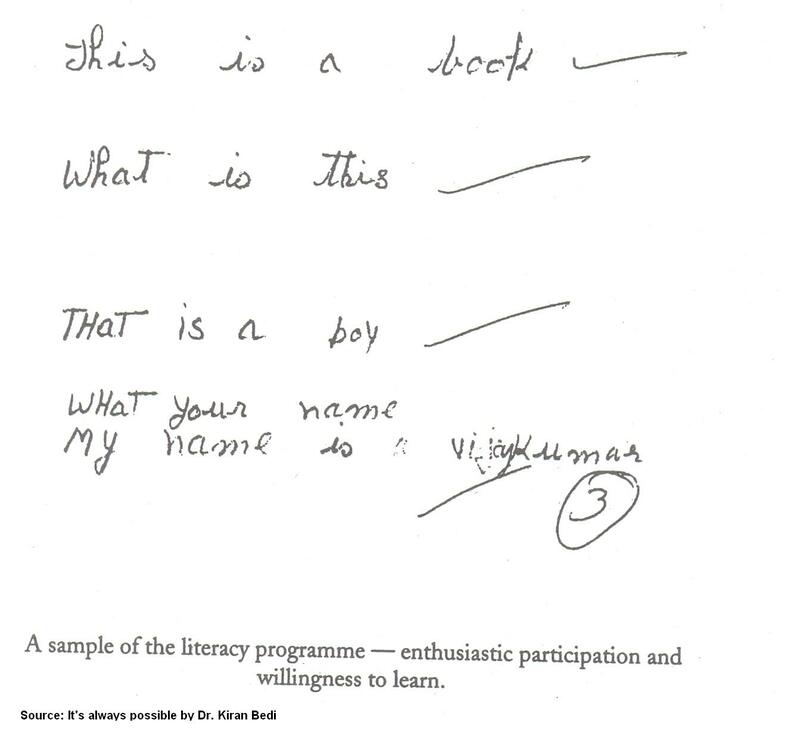 “This gave me a full cover, with a sense of grace” She writes. The Superintendent of the jail, K. R. Kishore, followed her. There was no armed guard. She held a notepad in her hand to record on-the-spot observations. As Kiran filed past the waiting prisoners, the Warders, perhaps from the force of habit, started to physically contain the prisoners without the slightest provocation from them. Some even waved their sticks menacingly the onlooking prisoners, in a gesture to show concern for her security. Kiran signaled the Warders to stop doing this. She repeated: “I am asking you, do you pray? Please tell me.” She spoke in Hindi. The men looked towards the Warders as if to ask them if they were permitted to speak. The Warders were confused. Kiran moved closer to the bunch and directed the question to one inmate chosen at random. He answered, “Yes, sometimes,” nodding his head. “Very good. Who else does? You?” She pointed to another prisoner, again at random, getting even closer to the crouching men. They fell silent again. They had never prayed together. Then one of them, with one by one the staff and the other on me, said hesitantly, “Yes…” Others nodded their heads in agreement, wanting to be part of the prayer. “Do you know ‘Aye Malik tere bande hum, aise hon hamare karam, neki par chalen (O Lord we are your creation/ May our actions be worthy)?” She asked. Imagine if Kiran had sent out a survey through the Warders as the first step to gather the data! Source: “It’s always possible: Transformation of one of the largest prisons in the world” by Kiran Bedi, Sterling publishers.